We are huge seafood fans here. If we have a game day gatherings or any movie night, this is always the first appetizers everyone wants me to make. Has a great flavor to the sauce. I usually keep it this on warm in the crockpot if I need to make it ahead of time. Cooking for an hour on high. However the baking in the oven takes as little as 25 minutes. 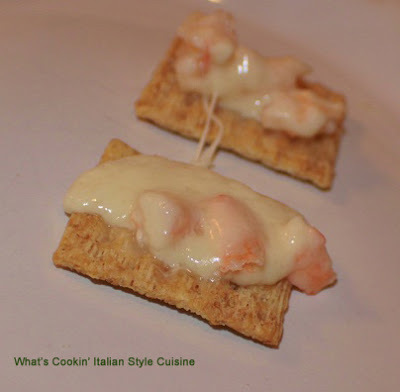 Either way this is a great appetizer for seafood lovers! Put crackers in the food processor. Melt 4 tablespoons butter in heavy duty large fry pan. Add peppers saute a few minutes then add the flour. Stir on low heat. Add cream/milk with a whisk to blend. Stir over the low heat until thickens. Whisk in the salt, pepper, sherry and pour into a bowl. Mix in the crab meat, shrimp to the sauce and pour into an oil sprayed baking casserole dish. Top with cracker crumbs and shredded white cheddar cheese. Add the remaining butter to the top and bake uncovered at 350 degrees until top is golden brown around 20 to 25 minutes. Serve with garlic bread, any kind of chips or crackers. I am going to have to throw a party just so I can make this. This dip looks fantastic. I like the term mouth watering used by Federica. Perfect for the Super Bowl party! Thanks for the recipe!